The 13 singers & hot trio that make up OJC love to perform! We can bring your corporate event, music series or festival some sophisticated swing as well as eclectic, original vocal jazz. Since its inception in 1992, OJC has collaborated with notable jazz, blues and gospel artists including Mark Murphy, Marlena Shaw, Madeline Eastman, Faye Carol, Brenda Boykin and Terrence Kelly. Venues have included Yoshi's, the International Association of Jazz Educators convention, The Great American Music Hall, the Bach Dancing & Dynamite Society, the Jazzschool and the Grass Valley Center for the Arts. The choir has performed at numerous jazz festivals including SF Jazz, the San Jose Jazz Festival, the Sonoma Jazz Festival, the Vallejo Jazz Festival and the Fillmore Street Jazz Festival. OJC also brings jazz into the Oakland public schools during Black History Month and Jazz Appreciation Month. Through the Bread and Roses Organization, OJC has brought its musical inspiration to those incarcerated in local jails and prisons. OJC is funded mainly through its performances, grants and individual donations. Those dollars fund day-to-day operations, artistic and professional fees. But what keeps OJC's collective heart beating most of all is the love of Jazz. Generally one or two 40 minute sets. 13 vocalists plus trio. Led by our Artistic Director, Katie Koeplin the Oakland Jazz Choir. 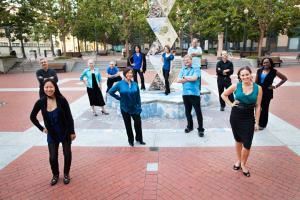 a non-profit, has been bringing wonderful and innovative jazz harmonies to Northern California festivals and concert series for the past 19 years. Accompanied by their tasty trio, OJC delivers exquisite 4, 5 and 6 part harmonies performing original and contemporary arrangements that include "April Joy" & “Minuano” by Pat Metheny, “Bernie’s Tune” by Bernie Miller a haunting arrangement of Billie Holiday’s “Don’t Explain,"swinging arrangements of the New York Voices as well as an cappella Bobby McFerrin tune. A technical rider will be provided at the time of booking. Sound can be provided by the choir in the event a sound system is unavailable at the venue.